stolen ice cream + awards, thank you. Wouldn’t you know it; I had this post written and almost ready to go when adorable Sara at Stalk My Kitchen goes and gives me an award. So Sara, thank you so very much; I promise in my next awards round-up I will steal one of your recipes and give you a proper thanks. This post has been a long time coming, but it’s about time I say thank you for a few awards I’ve been given over the past few months or so. As it turns out, time does actually fly when you’re doing something you genuinely love, and we’re running up on my 1-year blog birthday. That’s right, people; I’ve been doing this for almost one full year. August 20th will mark the actual day, but I’ll be celebrating a little bit in my head for the entire month. Celebrating that I actually did this, love doing this, and have you all to keep me company and encourage me forward while I continue to do this. Some way, somehow, I’ve managed to accumulate a few awards from fellow bloggers (and friends) along the way. I don’t know about you, but I feel like the best way to say thank you is to steal their ice cream recipes, make them for myself, and talk about them a little bit. So here goes nothing. First up, Jennie over at The Messy Baker. 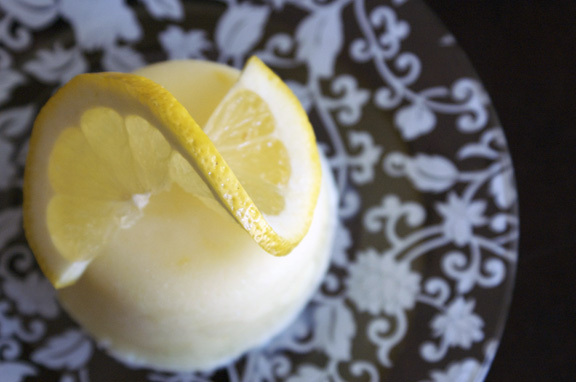 I made her lemon buttermilk sherbet, mostly because the idea of freezing-cold lemon buttermilk sherbet sounded almost like a necessity, as we’ve been experiencing record-melting temperatures here for what seems like months now. She began blogging in August 2011 – within days of my own blog starting up. So we’re a little like sisters, or friends in the same class. She makes a wicked granola. I made her maple nut granola awhile back, and the stuff went VIRAL in my household; I’ve probably made 15 batches of the stuff now, and we even made a few batches on vacation. It’s become The Family Granola. And it makes my house smell like I live in a pancake when I make it; win/win. Her food is tailor-made for good times. It’s accessible, comforting, and fun to eat. It’s the perfect food to watch a football game with. It’s great food to have friends over with. It makes you want to grab a spot on the sofa and stay awhile, and I totally would do that, If I lived closer. She’s training for a 5K right now. She’s even got a page on her website devoted to some very practical running tips. As an amateur (cough, cough) runner (ahem) jogger, I can appreciate how nice it can feel running about when you spend lots of time “quality-testing” cupcakes. She is just fun. Fun with a capital F-U-N. Fun to talk to, and fun to read. She’s just herself, and I love it when you read a blog and know that it’s just so honestly them talking to you. That’s always how I feel when I read Jennie’s posts. 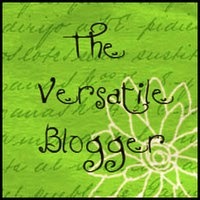 Jennie gave me the Versatile Blogger award; my first ever award, don’tcha know. Now, Jennie says I have to tell you seven things about myself. The problem? Sometimes rules make me nervous. So I’m going to tell you some things about myself, and we’ll just roll with it. Next on my list: Willow from Will Cook For Friends. I made her honey’d fig + goat cheese ice cream. Although, that’s a tiny lie because figs are so incredibly primadonna-ish in terms of season that i read her post, realized I had a container of figs (but not enough) in the fridge, ran to the store to get more to make this ice cream, and what? No. More. Figs. Those fragile little fruit planets were nowhere to be found. 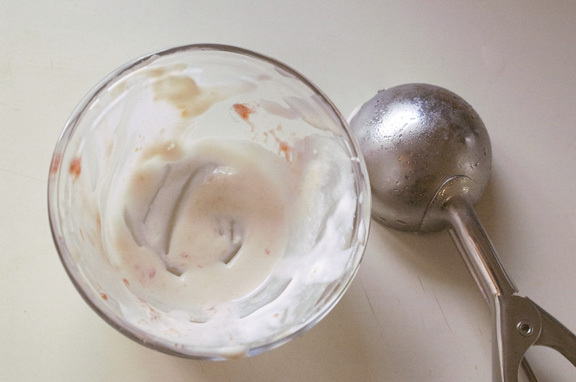 So I improvised and made a completely delicious honey’d apricot/sugar plum + goat cheese ice cream instead. It may not have been filled with figs like Willow’s was, but I hope she doesn’t mind the improvisation. Willow, like Jennie, also began blogging in August 2011; one day before I did. crazy; it’s like we were meant to find each other. Her food? It’s like she reads my mind. Things just show up on her blog that I feel I somehow need to have in my house that instant. I feel like maybe she eats/craves/longs for the same things I do, and she goes about it from a very seasonal perspective, and we have very similar climates, so somehow we must be on the same food wavelength. For instance, while I’m writing this, she posted a surprising little Asian stir fry, and I inexplicably feel compelled to make it. Eerie. I’m in love with her photos. I could look at just the photos on her website all day long. To me, they’re very peaceful and simple. Uncluttered photo-taking is something I admire, and she does it very well. She has a great quotes page on her site. You should check it out. It’s great for just having a moment. Doesn’t have to be a food moment; any old moment will do. She makes me want to do more with savory food. Sweets are more my natural inclination, but I think it’s mostly because I’ve managed to screw up more savory dishes in my life. She takes the fear away and gives me some great inspiration for gorgeous, healthy everyday food. PS: she’s getting married! now, this in and of itself doesn’t make a person awesome, but it does mean I’m really looking forward to hearing about the wedding plans in her posts. 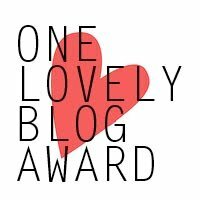 Willow bestowed upon me the One Lovely Blog award. That is awfully sweet of her, since I find her blog to be quite lovely, too. To accept properly, I’m going to say a big thank you to Willow and tell you a few things about me you probably don’t know. Finally, there’s Jen over at Juanita’s Cocina. She just recently made this coffee custard ice cream for her wife and I just about flipped. Why? I love coffee ice cream. 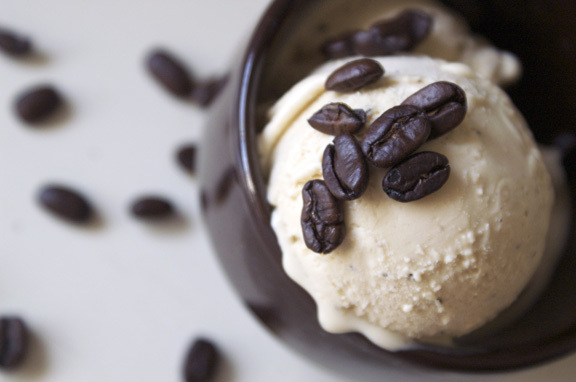 I basically love coffee anything, but coffee ice cream has always been a big favorite of mine, even when I was younger. I’m obsessed with it a little. So when this showed up on her blog, it was like fate. I made it as fast as I could; there are some days when the 15-hour lead time you need to chill your ice cream maker seems excessive. Unbearable, really. this was one of those times. because I had to wait like, 15 hours to make this. And it was 15 hours too long, if you ask me. Jen began blogging in January 2012, so she’s the newest of the bunch. You’d never know it, because she took off like a jet plane, and it feels like she’s been in my life for much longer. And I mean that in the “she’s like an old friend” way. It’s her birthday (real birthday) this week, so head over there and wish her a good one. She’s a fabulous mom. I know this because I know her, and she really is one of those women who just have such a natural affinity for mothering, and nurturing, and caring which extends to not only to her own son but to everyone she loves. And that is a rare gift. Jen’s food is comfort food: I would gain 100 pounds if I lived with her, because Jen would make me anything I wanted to eat. Like, from chicken gyros and homemade pitas to sopapilla cheesecake. Anytime. Because Jen is a giver, and she just wants to make sure you’re happy. Which means, 24/7 incredible food. Her english muffin toasting bread? 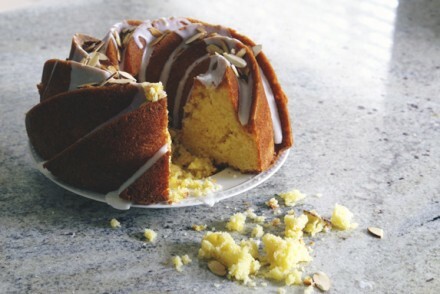 Astoundingly easy to make, and it is absolutely delicious. I can’t/don’t want to tell you how many loaves of this I’ve made. 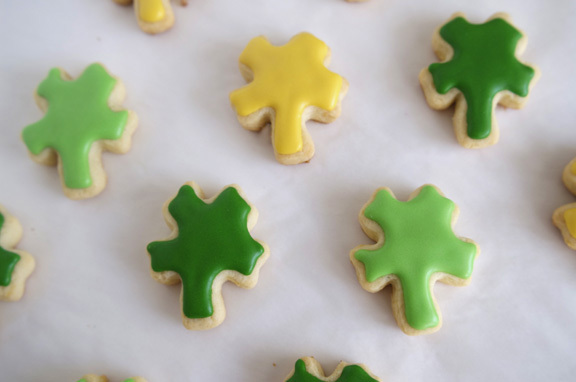 I liked it so much, I baked a few batches and gave it as gifts at Easter. Wrapped it with yarn and everything. Because it’s a giant, sliceable english muffin: is there a better door prize than that? I can’t think of one. Jen is one of the most genuine people I know. she’s true to herself, and what you read on her blog is completely authentic her. no gimmicks, no fancy-pants attitude, it’s just simply Jen. And she’s got just about a bazillion dedicated readers who love her just as much as I do, because she is herself. The voice you hear in her posts is the voice I hear when talking to her via email, and that’s not always the easiest thing to do. She is honest, she is open, and I love her for that. The world needs more Jens. Jen gave me not one, but two whole awards. 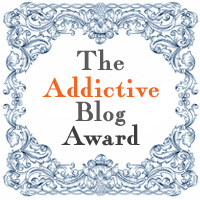 the Addictive Blog Award and the Very Inspiring Blog award. Since Jen doesn’t follow rules just as much as I don’t follow rules, there are no rules for these, says Jen. Except I have to tell you why I began blogging. I can do that. Also, I have to give Jen one giant virtual bear hug. DONE. EVERY LAST BITE OF ALL THREE OF THEM WAS ABSOLUTE HEAVEN. 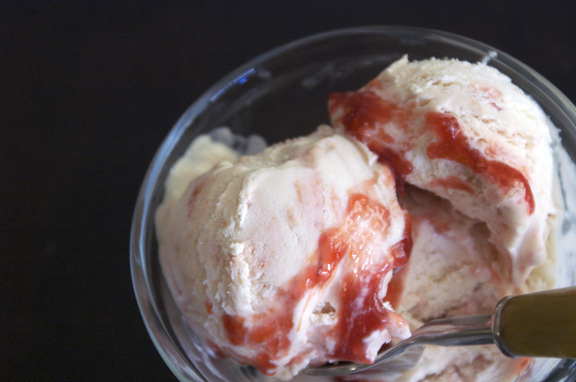 So if I were you, I’d give these girls’ recipes a whirl before it starts getting cooler out and you’re (slightly less) in the mood for ice cream. You could, if you want, pop that ice cream maker in the freezer to begin the chill, or gather some ingredients together to make these. Take a breather, because we’ve reached the point in this thing where I have to follow the rules (loosely) and tell you a few things about myself. I love charts and graphs. If done correctly, I firmly believe charts and graphs are like, the best way ever to fit something into your brain. And I find I need to fit as many things as possible into my brain. If I had a “dream” job (like when you’re a kid you want to be an astronaut), I’d want to be a composer. more specifically, a Newman. Probably Thomas, bud I’d take Randy. A scorer of films. Did you know they were related? Did you know that the film industry consider the Newman clan a “dynasty” of composers? There’s like, eight Newmans – all related – who compose music for films. And I wish I were one of them. I have an extremely detailed memory for things. You know how Marilu Henner can tell you everything that happened in her life, and on what date? It’s not like that. But it’s a few steps down from that. I have such a detailed memory, I wrote a book for my sister for her 30th birthday – right before I started this blog. an entire book of our (detailed) childhood memories. Best thing I’ve ever put on paper. It’s a little-known fact I worked at Williams Sonoma over the Christmas holidays one year. 2008, i believe. It was mostly a social experiment to see if I still could work in retail during peak season and not fall apart. Also, you get a 40% discount on merchandise at Williams Sonoma. I had a lot of fun, mostly due to getting to work at a beautifully lit place which smells perpetually like pumpkin pie and peppermint bark, and also because that happened to be the year the economy hit the brakes. HARD. Sales were down maybe 98% or something. I believe at some point everything in the store was half-off. They were throwing Breville hot chocolate makers out at passers-by. So, did I work? not really. but everyone got a lot of things from Williams Sonoma that year for Christmas. I still have my green apron. Why did I start blogging? Because I’m a writer. It wasn’t/isn’t just my job; I think I just am one, for better or worse. it is my heart and soul and I’ve been writing things since as far back as I can remember. my actual dream job when I was little was to be an author. Through the twists and turns life takes you on, I managed to squeeze writing in in one form or another, but not professionally until after college. My job? Essentially, it could have been boring. but I got to write, do some graphic design here and there, and I tried to make it fun. Thankfully, I had a boss who was all for making it fun (in his own way), and so it was. Enter the Wee One; I wasn’t expecting to stay home with her. Mr. Table left it up to me to decide, knowing we could manage either way, and I had fully intended to scale back to part-time in order to maintain the person who I had always been (a person who worked for a living) and balance that with raising a baby. All of that went totally out the window when I saw her sweet face. I tried to fight it, but I knew I wasn’t going back to work at all. I was done. But I’m not the type to sit at home and not have anything “adult” to do. And even with as much effort and strategy and thought as it takes to manage a child, I needed something to do that was just for me, and I had wanted to begin a food blog for a while. So I promised her a year of just her, and then we began to work on this blog. I think she loves it as much as I do: I let her take her own photos, and most of the dry ingredients are mixed by a tiny pair of hands. So that’s why I started blogging. I do it for myself, and I do it for her, and now, I am lucky enough to say I do it for you, too. So there you have it: me in a nutshell. And I’ve said it before, but I couldn’t have entered into a more gracious, encouraging, hilarious, terrific community of people than the ones in this one. The food community rocks hard. We’re all a little bit odd, in a way, and that has to be the best type of ‘workplace’ ever. I enjoy being here quite a bit, and that’s in large part due to all of you. I love Faygie because I think we have similar styles (we follow each other on Pinterest, and I adore everything she pins, from clothing to room ideas to desserts. I don’t know if she knows I follow her blog, but I do, and she can make a cake like nobody’s business, let me tell you. She does beautiful decorative work on her desserts, and everything she makes looks absolutely delicious. It is certainly one lovely blog. And she is one lovely person. I know she gave me this award, but she gets it right back. Why? Because I can think of no one who fits this award better than Jen herself. She is, in so many ways and on so many levels, one of the most inspiring people and bloggers I know. We’ve gotten to know each other pretty well over the past few months, and I am still baffled by how much she works at what she does; at her blog, at her actual career, and for/with her family. She’s awesome. And she makes everything on her blog; main dishes, desserts, sides, appetizers; you name it, she’ll give you a recipe for it. I personally like her Mexican food; she’s got some great traditional and non-traditional stuff over there. Here’s what: Emma herself is actually addicting. I “met” her when she started commenting on some of my posts. Emma, you see, has a way with words, and it didn’t take me long to start following her blog right back. In less than a year, I have learned about foraging for foodstuffs, how to eat pine needles, and where to find some supremely awesome chocolate. Also, she takes some really nifty photos of abandoned playgrounds and old boats, all of which I dig. I can’t wait to learn more things from Emma, but mostly I like hanging out with her on the internet. Natalie and I met contributing to the Serious Eats: Sweets “Share Your Sweets” slide shows over the holidays this past year. I would flip through them every week when they would come out, and each time, I would stop at a photo of (insert food theme of that week) which looked particularly amazing. It was always Natalie’s submission. And I thought, “who is this Wee?! Why is her food always so attractive?! ?” And the rest is history; I have followed her ever since. I think Natalie is versatile because she isn’t all desserts; she’s cheeseburgers too. Also, she’s got a series I hope she never stops doing (do you hear me, Natalie?) called Thursday Things, and it’s my favorite, utterly nonsensical, random way to begin a Thursday. Look at that! I did it; my first awards thank-you post, in the bag. Thank you for reading, and thanks again to both the bloggers who graced me with awards, and also to the bloggers who inspire me everyday. Which are way to numerous for me to list. Jus’ like crack! Or sugar. That’s me, addictive! 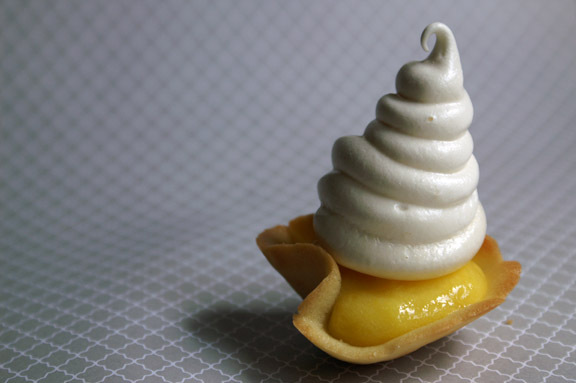 I don’t really like coffee, but the coffee custard ice cream sounds reeeally good right about now – I just mowed the lawn, it was hot, I am le tired. you’re welcome; you deserve it! I wish there was a more appropriate title for you though; the “random photos that i love” award, or something along those lines. i’m also le tired; it’s been a wicked long day of birthday decorating and fudge sauce-making. and i’ll say this about the coffee custard cream: that’s the coffeeish thing that people who don’t like coffee eat. like the set of people who aren’t coffee drinkers but love a good mocha every now and again? it’s right up their alley. it would make a fantastic milkshake too, now that i’m thinking about it. But, I love you. Even though I already told you that. You can never say it too much, y’know? (cough cough) riiiight, you are SO worthy, Jen. SO. Congrats 🙂 I really like reading your blog, and I believe you deserve all these awards. Your writing style is really nice to read, and the pictures are yummy as well! and the charts and graphs thing is so true! Diagrams are such a good way to present many things of the world, and so easy to remember them. Tina, thank you so much! you’re very sweet to say that; most days i feel like i’m just rambling on and on over here about cookies and cake, so it’s nice to know when people like what they’re reading/seeing. 🙂 I know i should just graciously say ‘you’re welcome’, but i’m still amazed when people say they like this little blog. instead i’ll say thank YOU for reading them. 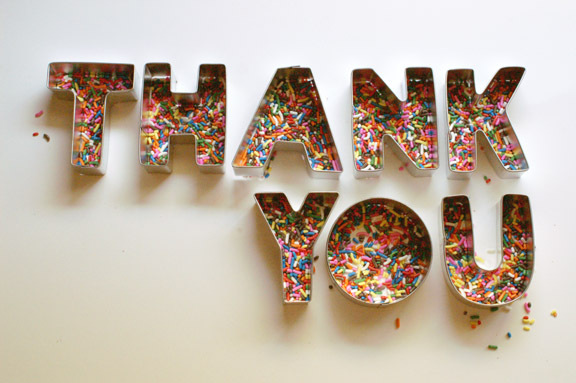 You wrote us a “Thank You” in sprinkles, how sweet! I’m so glad you enjoyed my sherbet and granola. I didn’t realize we started our blogs around the same time. Does this mean we’re soul sistas 😉 Thank you for your lovely comments about me and my blog. Hugs!!! We are totally sistas! 🙂 and thank you for those fantastic recipes; you know i’m making a few batches of that granola this weekend, shoving it into mason jars, tagging them and handing them out as “state fair birthday party favors” for the adults in attendance. I think everyone will love it, and once again, my house gets to smell like a pancake. yay! And you know, i didn’t realize until i was writing this post that we started blogging at the same time, either. I think sometimes when you find people you think they must have been doing this for awhile, even if they haven’t. 🙂 I’m happy we found each other. I’m not going to lie. Sometimes I bake the granola, even if I still have some left, just to get that warm, cinnamon bun smell wafting throughout my house. It’s a smell like no other. I’m feeling a bit famous here with my granola (sorry for the gigantic ego). I hope all of your guests enjoy it. And, my granola loves mason jars. They just go together so well. I can’t wait for your State Fair Party recap. jennie, seriously; it’s the best oven smell ever. you should market it to like, realtors who are trying to sell houses. you know how they always say one of their ‘tricks’ is to bake chocolate chip cookies in the house oven before an open house, because people feel drawn in by the smell? no, no. they need to make your granola instead. Something we have in common? We love the same blogs. Something we don’t have in common? Memory. I have no short-term or long-term memory. It’s really, really bad. And it’s not like I’m blocking out a traumatic childhood. Nope. Just can’t remember stuff. Something we almost have in common? Charts and graphs. Except in my case, it’s lists. Long lists on paper. Paper everywhere. Lists of things that can be checked off. Lists of things that can be crossed off. I SHOULD MAKE A CHART OF MY LISTS. blog love: i had a feeling that was true of us. memory loss: mr. table is also afflicted with the “i can’t remember things, big or small, short or tall, important or unimportant” disease. it’s not on purpose, he just simply cannot hold onto information for long. if you text it to him, it helps a little, but then he forgets you texted him…you know how it goes. vicious cycle. obsessive notes/charts and graphs: let’s go ahead and put this in the “totally in common” category. because i LIVE FOR notes and lists of things. in fact, i have color-coded notebooks and pens stashed all around the house so if the need to write a list overtakes me, i can do so, anywhere i’m at. grocery lists. lists of things to do that day/week/month/when i get my act together. food inspiration lists. library books i need to check out lists. they’re everywhere. and i can’t make lists on the iphone. because i can’t type correctly and instead of “celery” and “lemons”, spellcheck would rather me have “cells ergo” and “lemurs.” i love physically writing things on paper, because paper. does not. have. spellcheck. the best list: a brainstorm list. because it’s sort of a chart and list combined. you know when you start with the center bubble/main thing (say, state fair birthday party) and then shoot out little lines to and fro with animal choices, and food, and games? i could brainstorm list everything. now i’m going to make a chart of my lists; what a brilliant idea! but first, i’ll brainstorm how to do that.